"His mind, as a result of that stroke, unlocks itself," Ackerman says. "And we begin to learn about Eden's past." It's heart-wrenching stuff, told by an unusual narrator. And as Ackerman says in an interview, he was quite emotionally invested in writing it. It is his dead best friend, but it's somebody who was intimately involved with both Eden and with his wife. And throughout the book, his voice is trying to explain who Mary is, and ultimately the choice that Mary is asked to make. Because when Eden's mind unlocks as a result of the stroke, he becomes aware of his circumstances and is able to represent what he wants to have happen to him. And so it ultimately comes down to Mary of whether or not she's going to do it. This book really isn't about war. I mean, what happens to Eden is what happens in a war, and is what winds him up in that bed. But thematically, it's really a book about intimacy, and it's also about grief — which I think is a type of faith, because contained within grief is this assumption that if we make it through it, that there will be healing on the other end. I'm not sure that that healing always occurs, and when it doesn't occur, oftentimes we're left just waiting in this type of liminal state — hence the title of the book. Ackerman: I'm always touching something familiar when I'm writing — you know, I'm tapping my emotions. Sometimes when I'm out talking about my books, people will say: How much of you is in these books? The reality is: All of me is in these books. I live with these books for years; they're all that I think about; they're all that I do, so they are very much me. But I think that that is in many respects what the whole part of art is, is this type of what I would term "emotional transference." And what I mean by that is ... how many times have you gone to a movie, and at the end of the movie, you've cried? ... I would say in those moments you're feeling what the artist feels. When I sit there and if I'm writing and my writing is going well, I will be feeling something as I'm putting the story down onto the page. And if I've done my job, when you are reading, you will feel something. And isn't it remarkable that you will be feeling some percentage of what I felt? Martin: And in a sense, this is reflected in the plot, right? Eden is working for that transference — he is desperate to have people empathize with him, to understand what he is going through when he is incapable of communicating it. Ackerman: I think that's absolutely right. And central to this book are these ideas of communication — how can we communicate with one another when all of our faculties have failed us, and how can we reconcile decisions that feel impossible when there is no good answer or bad answer. I know lots of Marys, and I think we probably all do. The name is a very intentional choice ... you're looking at the original person [the biblical Mary] who is faithful to somebody that they love. ... Obviously, I'm a veteran as well, so I have seen how these wars and how even just trauma outside of wars can just echo and echo and echo, and how even when everyone wants to provide some closure, the people who are closest to events — the closure's never there, they're just always living with it, and they're waiting. I went in and out of war many times, and she waited and my family waited for me to come back. And my mother is also a writer — her example is probably one of the key forces that set me along this path. Ana Lucia Murillo and Reena Advani produced and edited this interview for broadcast. Patrick Jarenwattananon adapted it for the Web. Elliott Ackerman served five tours of duty in Iraq and Afghanistan, and he often draws on that experience in his writing. In a new novel out today, he explores the life of a seriously injured veteran named Eden and those who were closest to him. It is a story about fidelity and commitment and knowing when to let go. The book is called "Waiting For Eden." 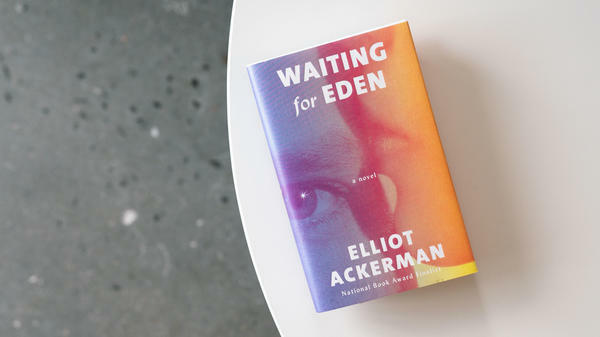 ELLIOT ACKERMAN: Eden is a man who, when the novel opens, we find him and he has been in a hospital bed for about three years, and he has burns all over his body. He's not conscious. He can't see. He can't speak. And he can't hear in his - and he's sort of trapped a little bit in his own mind and waiting next to him is his wife, Mary. And the book opens right before Christmas, and for the first time in three years, Mary leaves Eden to go back and spend the holiday with her daughter. And her departure causes Eden to suffer a stroke and his mind, as a result of that stroke, unlocks itself, and we begin to learn about Eden's past. MARTIN: So you have these two people at the center of this story, Eden and his wife, Mary. There is a third presence in this story - the narrator. Explain who this is. ACKERMAN: Well, it is his dead best friend, but it's somebody who was intimately involved with both Eden and with his wife. And, you know, throughout the book, his voice is trying to explain who Mary is and ultimately the choice that Mary is asked to make because when Eden's mind unlocks as a result of this stroke, he becomes aware of his circumstances and is able to represent what he wants to have happen to him. So it ultimately comes down to Mary of whether or not she's going to do it. MARTIN: I've read a lot about the dynamics in a marriage that is happening amidst war and the tensions that are inherent in that as people go off to deployments and come home and are injured and life changes forever. But this is - it really is about these three people who are bound together in this very intimate way. How did that dynamic come into your imagination? ACKERMAN: This book really, you know, isn't about war. I mean, what happens to Eden is what happens in a war and is what winds him up in the bed. But, you know, thematically, it's really a book about intimacy, and, you know, it's also about grief, which, you know, I think is a type of faith because, you know, contained within grief is this assumption that if we make it through it that there will be healing on the other end. You know, I'm not sure that that healing always occurs, you know. And when it doesn't occur, oftentimes, you know, we're left just, you know, waiting in this type of liminal state, hence the title of the book. MARTIN: You said recently that reading is a place that can transport you to someplace new. It's also an activity that can take you home. And I imagine that writing is the same. And if you believe that to be true, what happened for you in this process? Were you touching something familiar here? MARTIN: Will surprise no one. ACKERMAN: Well, you know, I would say in those moments, you know, you're feeling what the artist feels. You know, when I sit there and if I'm writing and my writing is going well, I will be feeling something as I'm putting this story down onto the page. And if I've done my job, when you are reading, you will feel something. And isn't it remarkable that you will be feeling some percentage of what I felt? MARTIN: And in a sense, this is reflected in the plot, right? Eden is working for that transference. He is desperate to have people empathize with him, to understand what he is going through when he is incapable of communicating it. ACKERMAN: I think that's absolutely right, and central to this book are these ideas of communication. You know, how can we communicate with one another when all of our faculties have failed us? And how can we reconcile decisions that feel impossible where there is no good answer or bad answer? MARTIN: Have you known a different version of Mary in your own life, someone who has endured that kind of excruciating waiting? ACKERMAN: I know lots of Marys, and I think we probably all do. And, you know, the name is a very intentional choice. It's sort of, in my mind at least, you know, the stripped down (unintelligible) woman but, you know, the original person who, you know, is faithful to somebody that they love. MARTIN: A Biblical reference to Mary. ACKERMAN: Yes. And I think that, you know, for me, you know, obviously I'm - you know, I'm a veteran as well, so I have seen how these wars and how even just trauma outside of wars can just echo and echo and echo and how even when everyone wants to provide some closure, the people who are closest to events, you know, the closure is never there. They're just always living with it, and they're waiting. MARTIN: You dedicated this book to your mother, and I was just wondering why. How is she connected to this? ACKERMAN: I went in and out of war many times, and she waited, and my family waited for me to come back. And you know - and my mother is also a writer. You know, her example is probably one of the key forces that set me along this path. MARTIN: Elliot Ackerman - his new novel is called "Waiting For Eden." Elliot, thank you so much. (SOUNDBITE OF MOUX'S "GAZE") Transcript provided by NPR, Copyright NPR.